Chelsea suffered a shock 2-1 loss to Wolves at Molineaux this evening, a defeat that now means the Blues sit in fourth place, 10 points behind leaders Man City. Maurizio Sarri’s side took the lead thanks to an own goal from Conor Coady, however goals from Raul Jimenez and Diogo Jota saw Nuno Esperito Santo’s side come from behind to claim victory against the former Premier League champions. 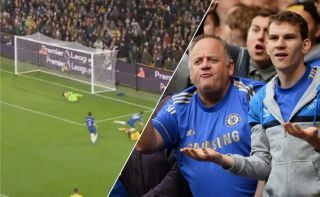 And it was Jimenez’s goal that got a few fans talking, however the Mexican international wasn’t the one to get fans chatting, but Chelsea’s Spanish ‘keeper Kepa Arrizabalaga instead. Jimenez’s goal saw the forward take a strike at the Blues’ goal from a tight angle, with Kepa letting the tame strike slip under his body fairly easily. The Spanish international really should’ve done better with the attempt, and his poor goalkeeping lead to some fans making jokes about him regarding former Chelsea shot-stopper Thibaut Courtois. A few fans jumped onto Twitter to claim the former Athletic Bilbao star ‘did a Courtois’ with his attempt to save Jimenez’s effort, something Blues fans may not be too happy about considering their feelings towards the Belgian following his move to Real Madrid this past summer. Here’s a clip of Jimenez’s goal, and the reaction surrounding Kepa to go with it. It wasn’t the Spaniard’s best night in a Chelsea shirt so far, let’s be honest! Kepa starting to concede the Courtois goals ????? ok so did Kepa met Courtois last weekend..
Kepa did a Courtois ?? That was poor keeping from Kepa! Not in Courtois class! Loooool poor GK’ing by Kepa. Weren’t Chelsea fans saying he’s better than Courtois? ?